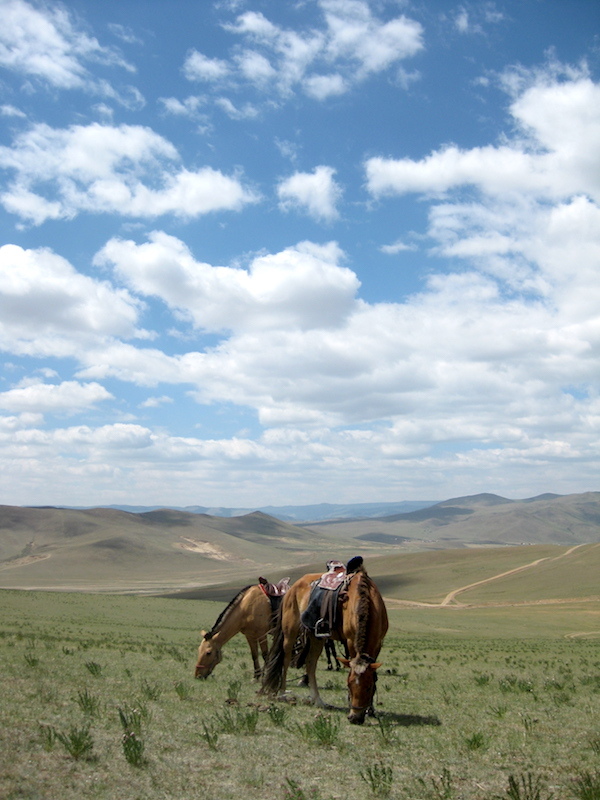 This is a short post about our sixth day of riding, which largely involved following (and crossing) the Tuul River. We’ve retraced steps from Terelj NP to stop in the vicinity of the previous night’s camp by the Tuul River, sitting on a hill overlooking the distant valley and road. It’s a gorgeous spot. The horses are grazing peacefully and it’s quite windy with intermittent cloud. 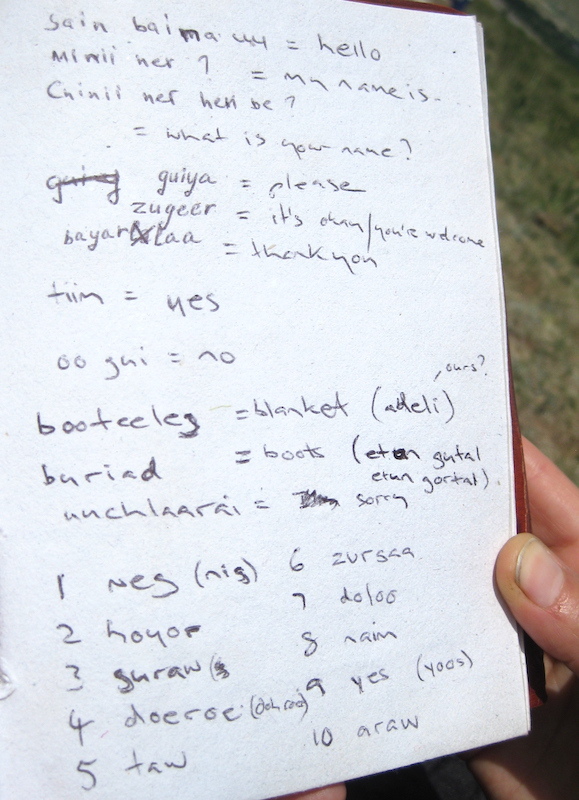 We’ve been learning Mongolian words the past few days… first we learnt ‘thank you’, ‘hello’, ‘my name is’ etc. Then we started learning how to count to 10. Yesterday we learnt 1-5 and we’ve just learnt 6-10. It’s fun. Burmaa (our guide) gives us spot quizzes from time to time. This morning’s ride was very pleasant. We meandered long the river and forded it a few times. Awesome fun. I sang some songs while riding along in my own little world — it seemed like the time for it. The wide open spaces often make me feel like singing. Fording rivers is awesome fun. Eventually we ended up at here at our lunch stop after a couple of hours riding, mostly walking with some trotting and cantering. I’m starting to understand my horse a lot more. He’s a lovely horse, docile and responsive. He goes downhill a bit slowly and has a slow trot, but he canters really well and seems happy enough to wade through water. Tonight we’re camping beside a different section of the Tuul River, this time right on its banks. We’re at a ford, with horses and cows crossing as we’ve been sitting here. Everyone has washed a bit (selves and clothes — our newly washed underwear is strung up to dry along an old paling fence), and it’s been a chilled-out couple of hours. As always when the sun fades (now) the temperature drops substantially, though. The afternoon ride was pleasant, although rather long with lots of trotting and cantering. We are starting to feel the fast pace and long days. I like not having to rush around in the morning with the late-morning starts, but I’m a bit tired of finishing so late. It must be around 9:30pm right now and we still haven’t had dinner. Although it’s nice not to have to do any of the cooking, we are somewhat at the mercy of the Stepperiders crew.